Who doesn’t like a steaming creamy mac ‘n cheese, coated in bechamel, rippling with cheese and crowned with crispy breadcrumbs? I would never throw shade at this comforting classic – and goodness knows we can all do with a little comfort these days – but I will say that you can have your baked pasta and cheese, and riff a little, too. What you get out of the deal is variety, an excuse to use up any lingering vegetables in your fridge, and an opportunity to add some extra goodies, like sausage if you’re so inclined. Simply mound them into a baking dish along with the al dente pasta and gads of cheese, bake until melty and golden, and no one, I dare say, will dream of objecting. I make dishes like this when I am looking for a quick solution for an easy dinner. It can be on the table in about 30 minutes, and it’s likely to be devoured in half that time. It’s lighter than mac ‘n cheese, and loaded with veggies. To moisten the pasta (there’s no bechamel sauce, after all) I toss the pasta with some of the pasta cooking water and add fresh mozzarella for creaminess. 1. Heat the oven to 350°F. Bring a large pot of salted water to a rolling boil. Add the pasta and cook until 1 to 2 minutes short of al dente. Scoop out 1/2 cup water, then drain the pasta. Transfer the pasta to a bowl and toss with 1 tablespoon oil to prevent sticking. 2. While the pasta is cooking, heat 1 tablespoon oil in a large oven-proof skillet over medium-high heat. Add the sausage and brown the slices on both sides, about 5 minutes. Transfer the sausage to a plate lined with a paper towel and pour off all but 1 tablespoon oil from the skillet. 3. Add the tomatoes to the skillet and sauté until they release their juices and soften, about 5 minutes. Add the garlic and chili flakes and sauté until fragrant, about 1 minute. Add the kale and sauté until the leaves soften, about 3 minutes. Add the pasta and 1/4 cup of the reserved water and stir to combine. If the pasta seems too dry, add the remaining water, 1 tablespoon at a time, until the pasta is moist but not wet. Stir in the mozzarella and 1 cup Pecorino. 4. Sprinkle the remaining Pecorino over the top of the pasta and transfer the skillet to the oven. Bake until the top begins to color and the cheese melts, about 20 minutes. Serve warm. Calling these “fish cakes” really doesn’t do these crispy succulent patties justice. The “fish” part is right, but “cake” infers flour, fat, and eggs with a bread-like crumb. These Salmon Fish Cakes have none of that. When my family and I lived in Denmark, a favorite family outing was to our local harbor where the fish market sold fish cakes or fiskefrikadeller, created from the daily catches hauled in on the fishing boats. When the fish were fileted, all the extra pieces were reserved for fist sized fish patties sold by the bagful with containers of remoulade, or tartar sauce, meant to be devoured family-style at the picnic tables perched over the sea. Every harbor with a fish market sold fish cakes, and the recipes were similar, made with white fish, such as plaice or cod, simply spiced and bound together with flour and egg, then pan or, more often, deep fried. Their flavor was mild, thanks to the white fish and simple seasonings, and they were very easy to eat, best washed down with a cold Danish beer (or juice for the kids) in the summer sun. While nothing could beat fresh fiskefrikadeller at the seashore during the summer, at home I would make my own fish cakes with the goal to create a more healthy and tasty family dinner. I wanted something lighter and brighter, with more fish flavor and less filler. After many renditions, I arrived at this recipe, which I now use as a template. While I vary the fish at times, depending on what’s fresh and available, the amounts remain constant, as does the inclusion of some, if not all, salmon to the mix. I find that salmon’s thick and buttery flesh yields a rich, tasty, and sturdy fish cake, and for deeper flavor I’ll often add cold smoked salmon, which adds a salty, smoky (and addictive) edge to the cakes. Fresh herbs, lemon, and chopped chiles balance out the richness of the fish, while the binder is kept to a minimum – just a dollop of Greek yogurt and Panko breadcrumbs, which do double duty as a crisp coating for the patties. The results are fresh, vibrant, and flavorful, and prove that you that can, indeed, take the cake out of the fish cake. The fish cakes may be formed up to 4 hours in advance and refrigerated until pan frying. If desired, more salmon may be substituted for the halibut for a 100 percent salmon fish cake. 1. Combine the salmon, white fish, and smoked salmon in the bowl of a food processor and pulse 3 to 4 times to finely chop without over processing – the consistency should be slightly chunky and not mushy. Transfer the fish to a large bowl. Add the 1/4 cup breadcrumbs, the onion, parsley, yogurt, lemon juice, hot sauce, salt, and pepper and stir to combine. 2. Pour the remaining 1 1/2 cup breadcrumbs into a shallow bowl. Using a soup spoon, scoop out a generous amount of the salmon mixture. With a light hand, carefully form the mixture into a plump two-inch patty. Gently roll the patty in the breadcrumbs to evenly coat and place on platter, lightly pressing the patty to slightly flatten into about a 1/2 inch-thick cake. Repeat with the remaining fish, adding more breadcrumbs to the bowl as needed. Loosely cover the platter with plastic and refrigerate the fish cakes for at least 1 hour or up to 4 hours. 3. Whisk the sauce ingredients in a small bowl and refrigerate until use. 4. Heat 2 tablespoons oil in a large skillet over medium-high heat until shimmering. In batches, carefully add the fish cakes to the pan without overcrowding. Fry the cakes until golden brown and cooked through, turning once with a spatula, about 3 minutes per side. Transfer the cakes to a plate lined with a paper towel and keep warm. Repeat with the remaining fish cakes. Transfer the cakes to a warm serving platter and garnish with the parsley or cilantro. Serve with lemon wedges and the yogurt sauce. A pedicure was the inspiration for this recipe. I rarely sit and thumb through a stack of fashion and lifestyle magazines – except when I am captive in a chair for a pedicure. As I picked up a well-read issue of O, I did what I always to with a magazine: I began at the back in search of recipes. And there I spied an article with a recipe by Cat Cora for chicken kebabs. Since my next stop was at the market to buy ingredients for a dinner, I immediately knew what I would make. With the image of the kebabs in mind, I came up with this recipe. Thanks to Cat and Oprah for the inspiration! 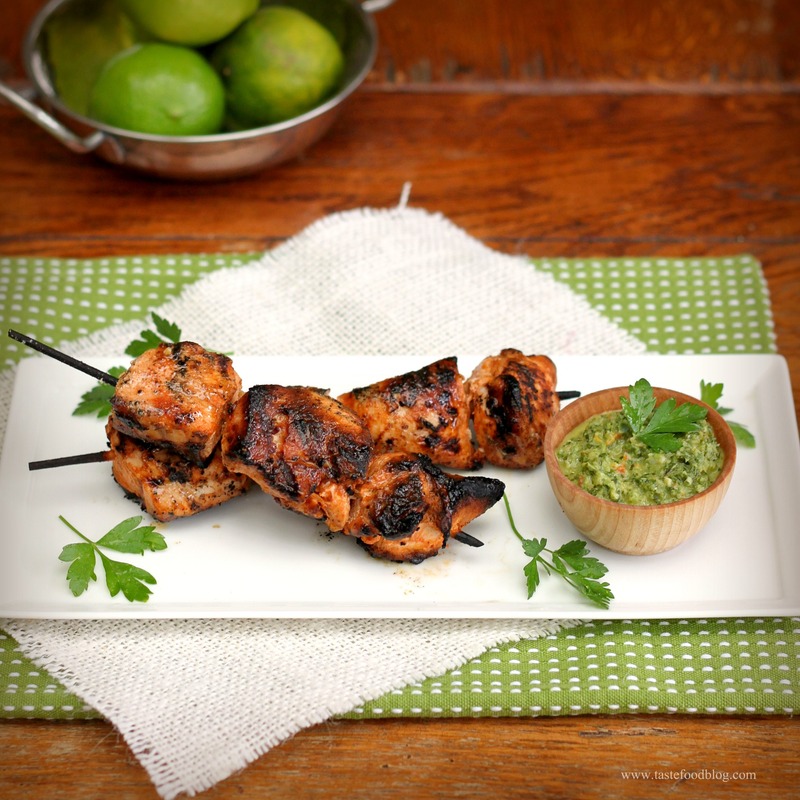 There is big flavor and little effort in this recipe for Chili-Lime Chicken Skewers, which makes it a perfect weeknight meal. If you can, marinate the chicken for several hours or overnight and let the chili, lime and sriracha marinade do the flavoring work for you. 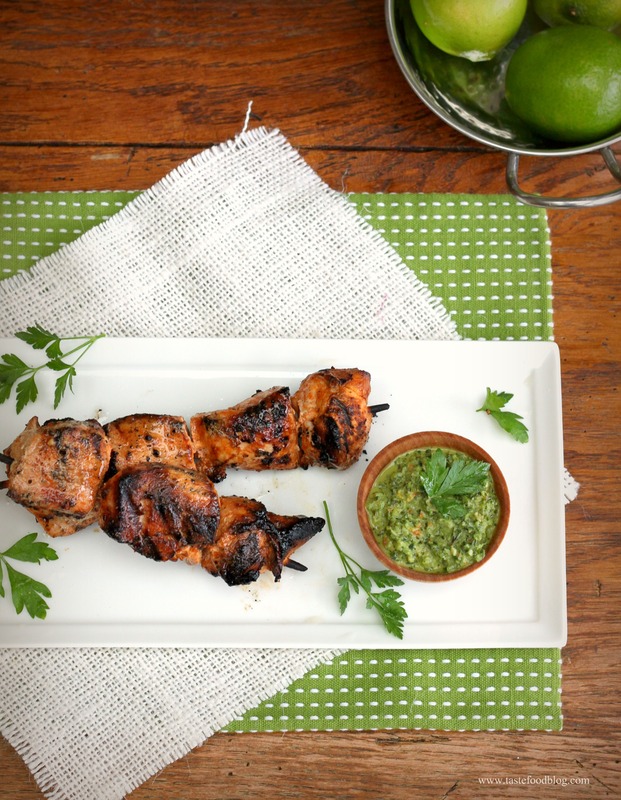 While the chicken sits in the refrigerator, all you need is a few extra minutes to blitz the ingredients for the green sauce. Weeknight dining doesn’t get better than this. Serves 4-6. Whisk all of the marinade ingredients together. Place chicken in a bowl and toss with marinade. Refrigerate at least one hour or up to 24 hours. Prepare grill for high heat. Skewer chicken on pre-soaked bamboo sticks; discard marinade. Grill over direct high heat until nicely charred on all sides and thoroughly cooked through, about 8 minutes. Serve with Spicy Green Pepper Sauce. The beauty of this sauce is that you may use whatever fresh green herbs you have on hand and tinker with the flavor. It always tastes great. Try to make it a few hours before serving to let the flavors develop. Makes about 1 cup. Pulse all of the ingredients in a bowl of a food processor to achieve a chunky sauce. Taste for seasoning. (May be prepared up to 6 hours in advance. Cover and refrigerate). This post and recipe from TasteFood was featured in Women’s Health Blog: What We’re Reading. Here’s the thing: It’s fun to eat with your hands, and Matt Armendariz has figured this out. 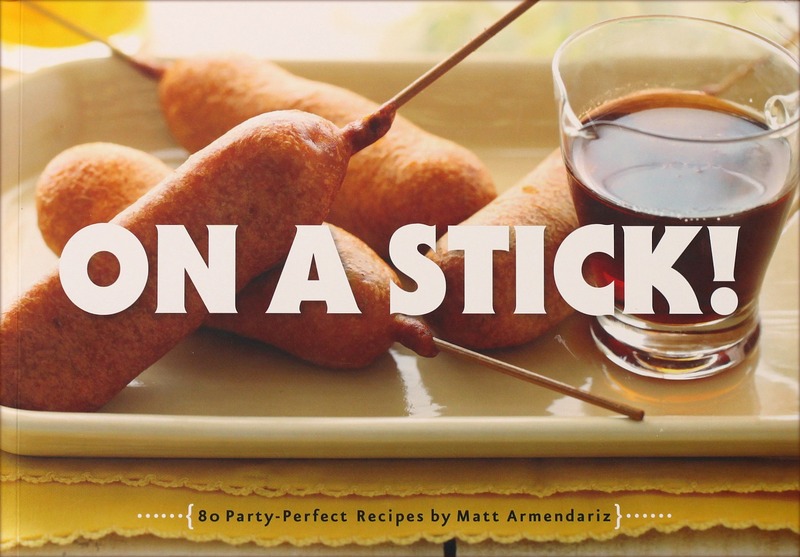 In his new book On a Stick! it seems that every food you may think of is fair game for skewering. It might be simple: Crudité Skewers with Latin Green Goddess Dressing or Caprese Sticks with Mozzarella, Basil and Tomatoes. It might be more complex: Deep Fried Ravioli or Spaghetti and Meatballs anyone? Or perhaps you are craving something sweet. How about Frozen Bananas Dipped in Chocolate or Strawberry Shortcake? Yes, that’s right – all on a stick. On a Stick! puts the fun in food, taking ordinary and exotic recipes and sticking it to them, so to speak, along with an assortment of dipping sauces – because, after all, dipping a stick in a sauce, dressing, salsa or chutney is half the fun of eating food on skewers. If you would like to enjoy a little simple pleasure, if you need to entice your kids to eat their veggies, or if you wish to invite your 20 closest friends to a party, you will appreciate this book. There’s something in it for everyone, and fun doesn’t get more tasty than this. 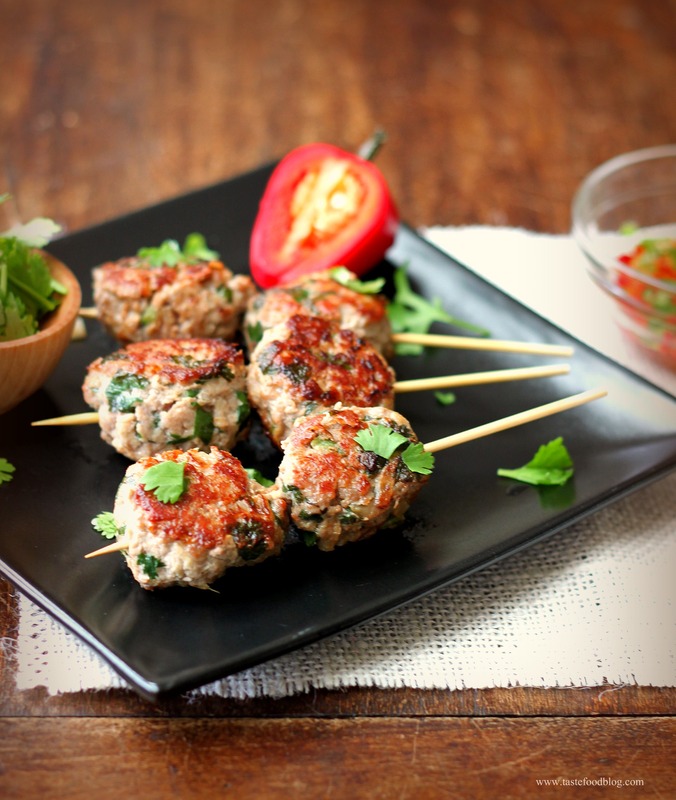 For my first recipe, I tried the Chinese Meatballs, which are a spicy, savory concoction of ground turkey, cilantro and spices. Fragrant with ginger and garlic, these addictive little morsels are served with a sweet and sour chili sauce. I pan fried them rather than deep fried them before dutifully skewering with bamboo sticks. And you know what? They really do taste better on a stick. Mix all of the ingredients together in a large bowl with your hands to thoroughly combine. Form into 12 small even balls. Heat 3 tablespoons vegetable oil in a skillet over medium high heat. Add the meatballs in one layer without overcrowding. Cook, turning, until browned on all sides. Transfer to a plate lined with a paper towel. Repeat with remaining meatballs. Skewer with toothpicks or bamboo sticks. Serve with Sweet and Sour Chili Sauce. Stir vinegar, sugar and lemongrass in a saucepan over medium heat and cook until sugar dissolves and liquid reduces by one-third. Strain into a bowl and cool completely. Stir in mint, cilantro, garlic, red jalapeño and ginger. Serve warm or at room temperature, alongside the meatballs. Recipe reprinted with permission from On a Stick! Written and photographed by Matt Armendariz. Published by Quirk Books. Full disclosure: I received a free copy of On a Stick! from Quirk Books.